The Criterion – ‘An Illustrated Weekly Journal’ – was published weekly from August 1896 to March 31, 1900; and monthly from April 1900 to May 1905. 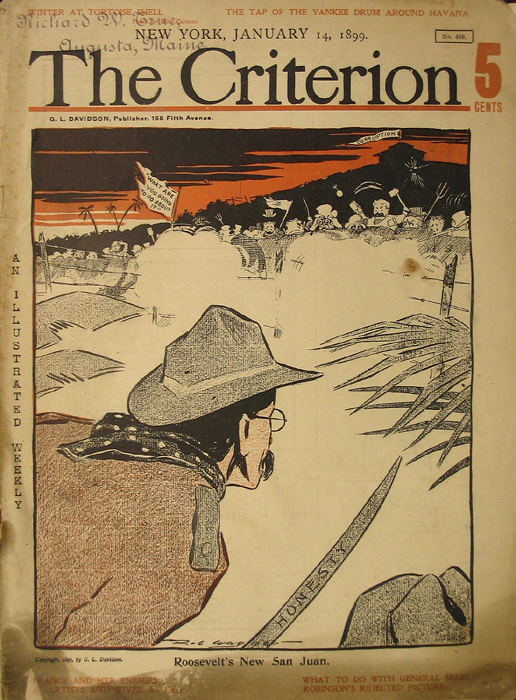 Cover of July 23, 1898. The widowed Mrs. Grace L. Davidson was a recently retired St. Louis school teacher and principal when she purchased the St. Louis Life in the summer of 1896. 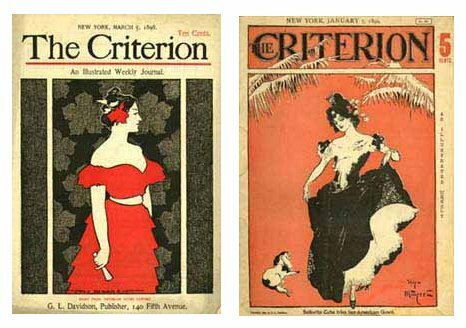 St. Louis Life was a licensed imitator of the New York Life, permitted for a fee to reprint art and jokes from the magazine to spice up local gossip and society news. Mrs. Davidson was interested in building an entirely new magazine on the foundation of the St. Louis Life. Soon after her purchase, she changed the name to The Criterion and began printing more and more original material. Sometime in the next year, Henry Dumay, a transplanted Frenchman and regular contributor, became editor. He convinced Davidson to move the magazine to New York, which she did with the September 25, 1897, issue. The editor’s chair was temporarily occupied for two months by Dumay’s assistant editor, the young Rupert Hughes. Then, the 52-year-old Irish-American newspaperman named Joseph I.C. Clarke took over. At first glance, Clarke seemed a curious, if not disastrous, choice for the editorship of a cutting-edge arts and letters magazine. But The Criterion under Clarke only got better. 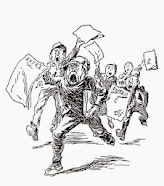 In his youth, he had been a Fenian fighting for the freedom of Ireland; perhaps this strain of his character made him naturally sympathetic with his high-spirited, new-thinking contributors. On the other hand, he was a mature writer and he reflexively trimmed out the youthful nonsense that had subjected The Criterion under Dumay to no small amount of abuse in the popular press. The magazine’s freshness carried through to its design, where artwork sprung up unexpectedly, violating margins, and the whole issue pulsed with life visible. Most of the issues featured a two-color political cartoon on the cover, usually drawn by Rob Wagner. He began his career several years earlier on the Detroit Free Press and then did some work for The Chap-Book. His drawing style was original, bold, and posterish. 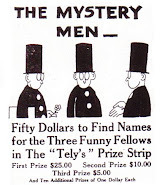 This is the last cartooning work he did, later turning up in Hollywood as a silent film director and then as the editor of the gossipy Beverly Hills weekly, Rob Wagner’s Script (1929-49). Clarke reports that Davidson played virtually no role in the running of the magazine; the queer twist in the tale is that she wasn’t even paying the bills. Apparently, Davidson, with no fortune of her own, was entirely dependent on the largess of an unnamed St. Louis heiress, who had bankrolled Davidson’s purchase of the St. Louis Life and had been sending Davidson $1,000 a week since then. Because Davidson had had a bad experience with a distribution company in St. Louis, she refused to do business with the American News Company, which had a virtual monopoly on the distribution of American magazines; instead she set up her own distribution network. 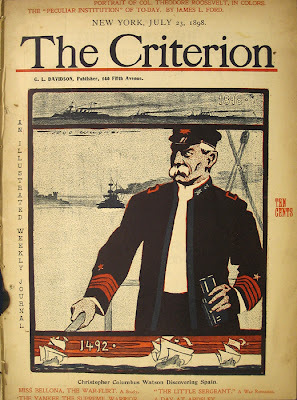 This foolhardy scheme cost the magazine thousands a week in potential revenues; in the years between the Civil War and World War I, shunning or being shunned by the American News Company was probably the number one reason why good magazines failed. Eventually, the St. Louis money source tired of the steady drain. Davidson tried to rectify the situation by hiring a ‘coordinating manager’ to work with Clarke. Clarke had no faith in him and he promptly resigned, returning to The New York Herald, from whence he came. The magazine foundered without him, and Davidson sold out not long after, presumably returning to St. Louis. 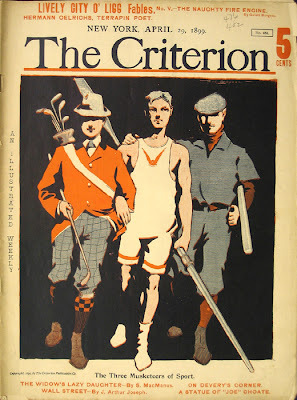 The new owners turned The Criterion into a monthly. It soldiered on for five more years, but the spark had died. It was not the magazine it once was when the end finally came in 1905.